This month I’ve explained how you can safely take the Bar Method when you have issues with your joints in particular areas of your body. I started with foot and ankle issues and worked my way up to knees, hip and back problems. As you may have noticed, each of these body parts has it’s own “best practices” regarding how and how much to exercise if you’re nursing an injury to one of them. Finally we come to shoulder conditions, which present their own set of issues due to the odd and unique history of this joint. Instability: Sometimes, one of the shoulder joints moves or is forced out of its normal position. This condition is called instability, and can result in a dislocation of one of the joints in the shoulder. 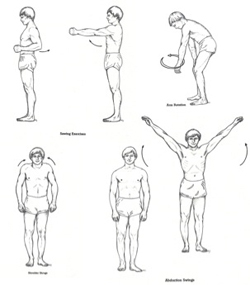 Individuals suffering from an instability problem will experience pain when raising their arm. They also may feel as if their shoulder is slipping out of place. Impingement: Impingement is caused by excessive rubbing of the shoulder muscles against the top part of the shoulder blade, called the acromion. Medical care should be sought immediately for inflammation in the shoulder because it could eventually lead to a more serious injury. Rotator Cuff Injuries: The rotator cuff is comprised of a group of muscles and tendons that hold the bones of the shoulder joint together. The rotator cuff muscles provide individuals with the ability to lift their arm and reach overhead. When the rotator cuff is injured, people sometimes do not recover the full shoulder function needed to properly participate in an athletic activity. Fortunately physical therapy is highly effective at treating mis-aligned shoulders for the same reason that they are so often tweaked, namely that joint can be coaxed back into its correct position almost as easily as it can snap out of it. Here, for example, is a PT routine from a highly regarded book on sports therapy called “Peak Condition” by Dr. James Garrick. (Consult your doctor before you try doing these moves.) You can see that Garrick’s exercises involve simple repetitive motions that act to nudge the bones back into proper alignment. Let’s say you have a shoulder condition and you’ve embarked on a course of physical therapy. Can you also do the Bar Method, and can it play a role in your recovery? Absolutely. The Bar Method’s arm exercises were designed by a physical therapist to be as safe and therapeutic for your shoulders as possible. In addition, both studio-based classes and DVD workouts offer you alternatives for doing the exercises without raising your arms higher than shoulder height, a motion that is usually painful to do if you’re nursing a shoulder injury. During shoulder walks, opt for raising your arms no higher than shoulder height. Do push-ups against the bar and keep your elbows pointing downwards. During the “fold-over” exercise (At right, top is Heather demonstrating the unmodified position; bottom is the modification) hold onto the bar with your elbows pointing downwards. Use a strap to hold onto during the “under-the-bar” exercises. You can place a few small mats under your back during the abdominal curl section to lessen the effort in your arms. Feel free to keep your arms at or lower than shoulder height when raising the arms is simply a matter of choreography. For “chair” and “water-ski seat” (exercises in studio classes only), substitute standing thigh and standing seat. In the end you’ll be glad you stuck with exercising in spite of your condition. The strength you’ll gain will pay off in greater stability and less risk of injury going forward.